The Democrats' "Bush's Debt" Problem. Whenever discussions of the massive increase in the federal debt under Obama, Pelosi, and Reid come up, you can always count on a liberal to say, "Oh yeah? Well Bush (insert wildly exaggerated, or flat out erroneous, claim here)." "Democrats are willing to do whatever is necessary to raise the debt ceiling, not for future borrowing but to pay the debts that we racked up in the past. Which, mostly was racked up by a Republican House, a Republican Senate and a Republican President in the last 8 years. Newsbusters' Tom Blumer did a great job of debunking this statement. Blumer showed that President Bush and the GOP House and Senate from 2003-2007, ran up around a 1/3 less than "all other situations" in which party control of the presidency and congress varied. What about the other years of the Bush presidency in which the Democrats controlled the House and Senate and when the congress was split? Using the U.S. Treasury data from Blumer's report gives us the graph below. 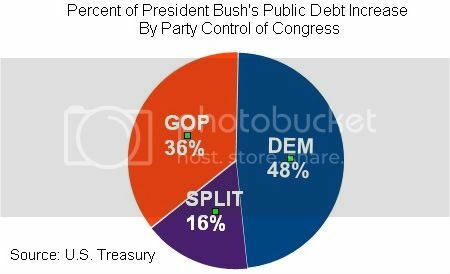 So, almost half of the debt accumulated under President Bush came from a House and Senate controlled by the Democrats. And the Democrats controlled both houses for a less amount of time than the Republicans. That old saying sure is true; when you point a finger, you have three more pointing back at you. Twitter unveils it's brand new "Fail Whale."